On the evening of Saturday, Jan. 21, 26-year-old Jason Lee Grant was struck and killed by a hit-and-run driver on Foster Road at SE 70th Avenue. Long dubbed the "Foster Freeway" by neighbors, this tragic incident further highlights the need to improve pedestrian safety in an area considered a high-crash corridor by Portland Bureau of Transportation (PBOT). "And sadly, there’s no guarantee he’ll be the last until the city implements real safety improvements, such as safer crosswalks, more visible signage, and better lighting," laments Jeff Lynott of Foster Powell PDX. "Pedestrian safety has historically been overlooked in favor of keeping traffic moving quickly." According to the city's Existing Conditions Report of SE Foster Road from May 2011, "approximately 26 percent of the corridor is lacking sidewalks or pedestrian amenities," and "the average distance between pedestrian crossing improvements (signals or pedestrian islands) is 1,120 feet, or nearly one-fourth mile." Amongst the news of this recent accident and the negative city report, neighbors can find some closure—the driver responsible (53-year-old Jim Dean Patterson) for the hit-and-run has since come forward and faces two counts of failure to perform the duties of a driver—and tempered optimism for the future: In August, the city approved $3.25 million to go toward Foster Road safety enhancements, among other things, including "improved pedestrian and bicycle crossing safety and access" with a goal of enhancing "safety at high-crash locations on the road." But, SE Foster is hardly the only place in town facing pedestrian safety issues, and its Walk Score ranking paradoxically highlights this fact. Ranked at 26 out of 89 Portland neighborhoods on Walk Score, Foster-Powell is in the top third of walkable neighborhoods, rated 10 points higher than Portland’s overall average, according to Walk Score's metrics. Stretches on Sandy Boulevard need sidewalks fixed, 16th and East Burnside could use a pedestrian crossing, and pedestrians on North Williams have long been known to dodge both cyclists and motor vehicles. Even ped-friendly areas of downtown could be improved as highlighted by this comprehensive, interactive map where you can contribute your own problem spots. Many of these locations require the same attention. So, what can neighbors do to improve pedestrian safety on their own without waiting for government, or in Foster's case, almost 10 years since the 2003 streetscape plan-adoption to fund allocation? Find a list of resources and examples on Neighborhood Notes to help you improve pedestrian safety in your community. 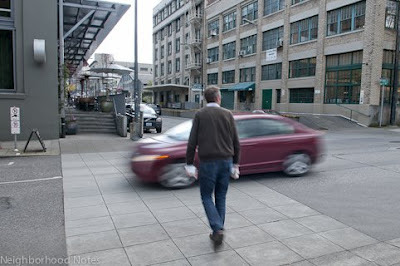 I came across http://www.pdxnoise.com/2012/02/how-to-improve-pedestrian-safety-in.html and wanted to thank you for including Walk Score! We are happy to share our data with PDX Noise readers. We’ve partnered with Redfin and are requesting that existing links be updated to a new page that features specific scores for the Portland area. Would you be willing to update the link on the text “Walk Score ranking" to https://www.redfin.com/city/30772/OR/Portland/housing-market#transportation? Your adjustment is greatly appreciated!